Hey, friends! It’s time to get back to some sewing! 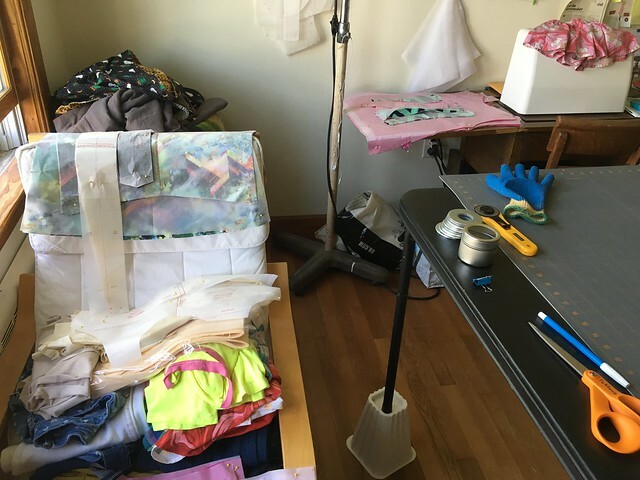 A lot has been going on in the sewing arena over here, and I wanted to share some exciting places my blog has been popping up as well as give you a quick progress report. 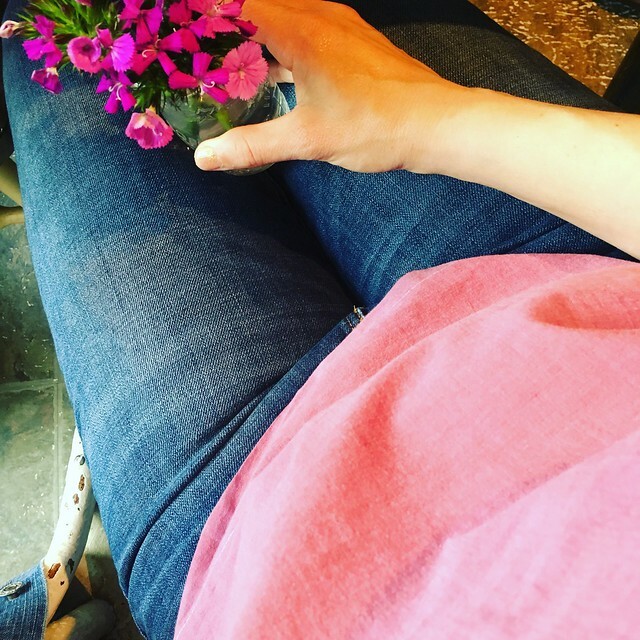 In May I linked up my jeans post with Allie J.’s blog for her Sewcial Sew: Basics challenge. Every month she puts out a challenge, and if you sew something within the month that fits the theme, you can put a link to your blog post on the page. At the end of the month, she posts a round-up of all the links. It’s a great way to discover new blogs and it’s really fun to look at everyone’s projects. 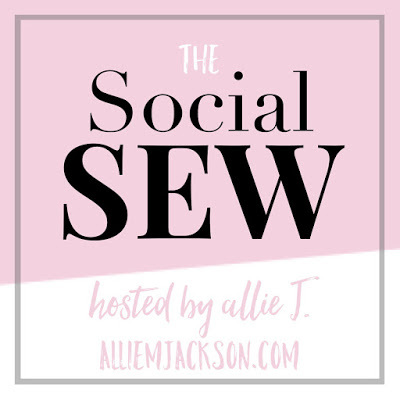 As Allie says, the theme is general enough to allow a lot of latitude, but should give you some guidance if you aren’t sure what to sew next. This was my first time joining in, and I really enjoyed it (plus, Allie said some very kind things about my jeans, so that doesn’t hurt!). Thanks, Allie! The June 1st blog post over at the Makery revealed the blogger line-up for this year’s Refashioners 2016 challenge…and guess who’s on the list? Me! I’m so honored to be included in this group. 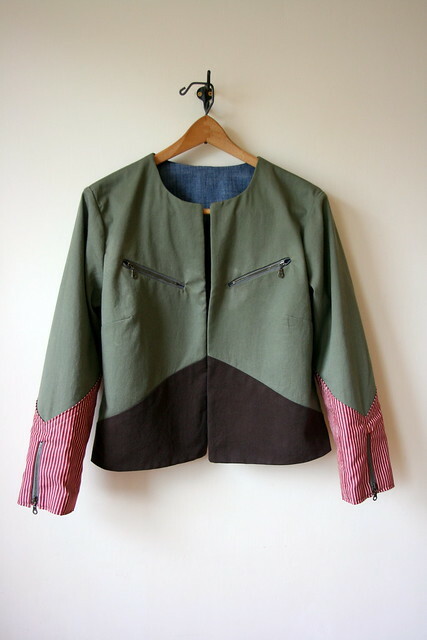 The Refashioners challenge is a chance to take a specific type of garment and refashion it into something entirely new. Creating clothing in this way is really fun. It takes a lot of thought to decide how to refashion the item(s) you are working with, but the end results of everyone’s creativity is truly fabulous. Last year’s theme was men’s dress shirts and I made a lined jacket from four shirts for the competition. This year’s theme is jeans. You can use one pair or you can use ten! What do you think? Are you game? If you want more details, either about the blogger series or the competition that follows, check out Portia’s blog. There’s plenty of inspiration on my Denim Pinterest board if you need a little help getting started. For extra reading on the idea of refashioning, you can also find Portia and fellow participant Marilla Walker in this Seamwork article. Last but not least on the sewing challenge front was Me-Made-May ’16. I made my pledge to wear at least one me-made article of clothing daily, wear two me-made clothing items in the same day at least once a week, and not to repeat items within a week. I also decided I wasn’t going to make a big effort to take daily outfit photos this year since that was a lot of work last year. I took some quick and easy photos here and there for Instagram, but that was it. So how did it go? I would say it went well. I decided pretty quickly that I was going to throw the no-repeats-within-a-week restriction out the window. It wasn’t because I didn’t have enough clothing that I had made, but because sometimes I loved an item so much that I wanted to wear it multiple times in a week. I was amazed at how much easier it was to do the challenge this year over last year. A full year’s worth of sewing has really filled a lot of holes in my wardrobe and/or replaced garments that didn’t fit as well and that I didn’t love as much as those I’ve made. It’s a great feeling to see that accumulation of skill and accomplishment. While it may seem like I haven’t been doing much actual sewing lately, the opposite is true. In addition to working on my Refashioners project behind the scenes, I’ve been gearing up to face down one of the (many) areas of sewing that I have yet to successfully master: swimsuits! I am deep in the trenches of swimsuit making. Cut out bathing suits, jeans remnants, and mending are piled everywhere! I had a whole long section in this post giving you an update on where I’m at with all that, but I decided to cut it and save it for another post. This one is getting long, so let’s wrap it up with some fun recommendations instead! If you want to try your hand at making a bathing suit, you might like to look at the many suits featured on the Curvy Sewing Collective’s Curvy Swimsuit Sewing Pattern Round-Up. There were several pattern companies they featured that I wasn’t familiar with. Are you mourning the death of David Bowie? Do you like puppets of the Jim Henson type? How about Jennifer Connelly? If any (or all) of these apply to you, may I humbly recommend a blast from the past? I put before you the movie The Labyrinth. I didn’t listen to David Bowie’s music, but I LOVED him in The Labyrinth. It’s still one of my favorite movies. My favorite book growing up (starting sometime in elementary/middle school) was Wuthering Heights by Emily Bronte. I knew I had finally found the perfect iteration of this story when I saw the edition illustrated by Fritz Eichenberg. His illustrations capture the essence and feel of the story better than any others I’ve seen. I think I need to start using this method to cook my shrimp. Do you think it will work on chicken?